Wholesale / Retail .... Factory Direct! HLC New Look is your Southern California LA area (Los Angeles, San Diego, Santa Barbara, Ventura, and Orange Counties) USA dancewear and skatewear factory wholesale/retail outlet. We work with you to design your own costumes, using any original designs/fabrics/colors you may dream of, to create a stunning unique look for solo or group. Anything you can draw, anything you can describe, or any picture you find, our design and production team can replicate. Bring or email us one or more pictures, circling the parts you like from each. Or simply describe your ideas and the theme of your dance. We will custom design costumes to your specifications and price point and respond with drawings and fabric samples for your approval. We custom design and manufacture dancewear, skatewear, practicewear, competitionwear, sportswear, ballgowns, tutus, leotards, unitards, tops, skirts, dresses, prom dresses, evening gowns, and costumes for ballet, ballroom, Latin, swing, salsa, jazz, tap, hip-hop, flamenco, polynesian, modern dancing, and belly dancing; skating, ice dancing, musical theater, gymnastics, workout, drill teams, and cheerleading. We come to your studio to measure your dancers. We return for fitting and alterations as necessary. For non-local customers, we ship by FedEx. Tutu prices, including bodice, begin at $45 for children's tutus, $400 for classic 12-layer professional tutus, without decoration. Our ballgowns and dresses are custom-made 1-of-a-kind with geniune Swarovski crystals, including ballroom dance dresses, ballroom dance tops, ballroom dance skirts, ballroom dance gowns, Latin dresses, Latin tops, Latin skirts, salsa dresses, salsa tops, and salsa skirts. All items are customized to your needs and price point. Please use Measurement link above, then email or fax your measurements and design ideas to us. Prices begin at $450 for a simple dress, $800 for a simple ballgown without stones, $1300 with stones. Men's items include ballroom dance pants, ballroom dance tuxedos, ballroom dance tail suits, ballroom dance shirts, and ballroom dance vests. Tuxedo prices, including pants, begin at $800. 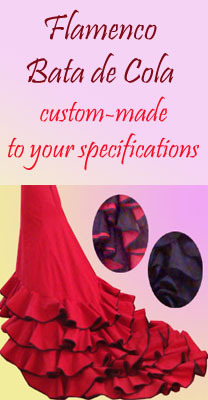 We make stunning original Flamenco Bata de Cola, flamenco dresses, flamenco skirts, flamenco tops, and flamenco shawls for solo or group. Flamenco dresses begin at $180, skirts $40. HLC New Look specializes in ballet dancewear, ballroom dancewear, Latin dancewear, swing dancewear, salsa dancewear, jazz dancewear, tapdancewear, hip-hop dancewear, flamenco dancewear, polynesian dancewear, modern dancewear, belly dancewear; skatewear, and gymnwear.